I like jewelry. While costume jewelry can be fun, I prefer a piece that can stand the test of time. A simple, elegant piece can dress up a pair of jeans or pair with a cashmere sweater. The specialness of a handmade, one-of-a-kind piece can make the wearer feel special even on the worse days. 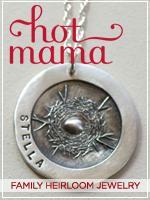 Hot Mama Designs creates jewelry that celebrate special occasions in women's lives. From motherhood to family, each handmade object has character and personality. The jewelry seeks to inspire stores and celebrate life. Based on the Japanese concept of wabi-sabie, implying the beauty of things that are unpretentious and unconventional, the duo of Shannon Sunderland & Sahra Cahoon want to celebrate the beauty of a handmade object. It is time to put away the dime a dozen jewelry that is seen on every street. Give a gift that is from the heart and can be treasured for generations. This holiday season celebrate the uniqueness in all of us with a handmade piece of art from Hot Mama Designs. Disclosure: I wrote this post as part of a promotion.